Politics: Power, Governing, The struggle of power, negotiation Definition: Comes from the Greek "Polis" (City state) and "Polity" (concerning the City state) - Power, institution, conflict and activity. UK is a bicameral system (has to chamber government), Lords and Commons. Politics as Power (4 types): Coercive, Absolute, Persuasive and Legitimate Politics as Institution: Local government, regional assembly Politics as Conflict: Resolves without violence (Ideologies, national/international, enough supply Politics as Activity: Protests, voting and pressure groups Authority: The right to make something happen Representative Democracy: Indirect (majority), if contrary to our decision: get out! Direct Democracy: People take part in all aspects (referendum) Pros and Cons of Representative Democracy: Pros: Control (logistically) deliberation, people who know more about it (not in favour of themselves) Cons: Lesser of evils, takes while to make decisions, loyal to party not constituents Liberal Democracy: Run by publicised laws and accepted (government chosen through fair elections). Liberal principles: Freedom of speech, religion, movements and devil rights. Parliamentary: Representative democracy. Totalitarian democracy: government controls all the aspects, no political opposition, ruling party. Independent observers in elections? Mostly no. Democracy - Rule by the people, open elections, for the people Direct - majority of the people take part actively Representative: vote for representatives, if we don't like them: get out! Constitutions: establish rules and principles (any organisation). 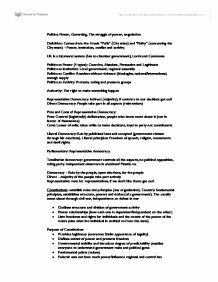 Country: fundamental principles, establishes structure, powers and duties (of a government). The usually come about through civil war, independence or defeat in war * Outlines structure and division of government activity * Power relationships (how each one is dependent/independent on the other) * Lists freedoms and rights for individuals and the extent of the power of the rulers (also what the individual in entitled to from the state) Purpose of Constitution: * Provides legitimacy (everyone: Stalin: appearance of legality) * Defines extent of power and protects freedom * Governmental stability and introduce degree of predictability (enables everyone to understand government rules and political game * Fundamental points (values) ...read more. * It is seen as relevant and up to date as it 'adapts and responds' to changing political and social circumstances. * E.g. Devolution a response to increased nationalism. * Supreme constitutional power is vested, ultimately, in the elected House of Commons. Changes therefore usually arise through democratic pressure. Effective Government * Given the absence of a 'written constitution', government decisions that are backed by Parliament cannot be overturned by the judiciary. * The concentration of power in the hands of the executive within the parliamentary system allows UK governments to take strong & decisive action. * E.G. Atlee Govt 1945 - 1951 established the NHS, introduced comprehensive national insurance, nationalised key industries: railways, coal, steel, electricity * Thatcher Govt 1979 - 1990: introduced privatisation, reformed welfare state. * History and Tradition: * Argument associated with conservative thinkers. * Constitution based on customs and traditions links past and present generations. * Given the role of common law and conventions, the UK constitution has developed and grown over time, giving it an 'organic' character. * It has historical authority as it has been tried and tested and therefore 'shown to work'. Criticisms of Constitutions: * It is sometimes difficult to know what the constitution says. * Confusion arises over unwritten elements such as ministerial responsibility and hung parliament Elective Dictatorship: Once elected UK governments can more or less do as they please (that is, act as dictators) until they come up for re-election (sovereignty is in parliament which the government of the day controls) Over centralised system of government with weak/ineffective checks and balances because; * Prime Minister dominates the cabinet * The House of Commons is more powerful than the House of Lords (Elective Dictatorship - weak arse checks and balances) * The Executive usually controls Parliament/Commons * Central government controls local government Weak protection of Rights: * The UK constitution provides weak protection for individual rights and civil liberties. ...read more. HOC: elected, lower but in reality higher because it's elected, sovereignty, 659 --> 646: 1. Legislation, Scrutiny and deliberation HOL: 731 (613 life), traditionally superior, average attendance: 415, imbalance: cons less Passing bills: - Public Bills - sponsored by government or backbench MPs - Private Bills - private businesses, local authorities, other organisations; not usually passed - Private Member's Bills - introduced by an MP often as a consequence of lobbying with pressure groups/constituency Scrutiny through: � Examine government and legislation as it passes through the House � Investigate workings of executive after enquiries are made � A system of committees: - Standing Committees - examine bills at committee stage. Permanent. - Select Committees - purpose to examine the work of the government departments (rotation system). Able to make recommendations - executive can ignore reports. Lack resources and money. Ad hoc. � Greater significance since 1997 Deliberation through: � Debates on the 'floor' - Government policy - Influence of the opposition? � Questioning Ministers and PM - Question Time - constituency/national - Prime Minister's Question Time (1994 Cash for Questions - the Nolan Report and the Downey Report) House of Lords: � 4 distinct areas of work: 1. Legislation All Bills (except money) must pass through the Lords. � Any bill put to the Lords in 2 successive sessions becomes law. � Clashes with government policy over: � Foxhunting � Homosexual rights � Higher education 2. Scrutiny � Legislation from House of Commons � Limited form of Question Time 3. Deliberation � High quality debates � More time � Not restricted in party political sense 4. Judicial � Final court of appeal � Law Lords will be transferred to the Supreme Court � Weaker legislative powers. � 1949 - Parliament Act = power to delay non-financial legislation for one year. � Salisbury Doctrine Type of Lords - Law Lords Hereditary Life Spiritual People's Wakeham Report: HOL; less lords, elected minority, remove heridatry peers, hold them accountable (15 years) Both houses: unrepresentative. UK GOV: imbalanced, bicameral, party system, checks and balances. ...read more. Debates are another key way of holding the government to account and can be said to make the House of Commons a very effective parliamentary chamber. There are a number of different types of debate, so I'll start by talking about emergency debates, which are in my opinion the most useful and important ones. How effective is the British Constitution in protecting the rights of its citizens? However, a number of the public and members of some specific political parties believe that the current voting system does not give the winning party legitimacy as it is not a fair system. People like these prefer proportional representation where the votes received are proportional to the amount of seats received in parliament. This basically means that parliament make it compulsory for judges to impose certain sentences concerning murder and repeated offences. Such laws now also exist for gun offences. The 2005 constitutional act now it has come into force has been said to remove many of the factors affecting the independence of the judiciary. Representative democracy therefore has the advantage that, in distancing ordinary citizens from politics, it encourages them to accept compromise. > Voter Apathy- Direct democracy places a heavy burden on all ordinary citizens, who have to participate continuously in the processes of government. Is nationalism in the UK reactionary or progreesive?? simply because the euro represents a loss of national sovereignty but also because the � is a symbol of a distinctive national identity. Conservative Nationalism is usually regarded as inward-looking and insular. It is may be destructive where it acts as an impediment to change - and particularly where it adopts an anti-immigration stance. 1, 2, 3 and so on next to names of candidates on a ballot paper. A voter can rank as many or as few candidates as they like or just vote for one candidate. Ballot papers are then counted by using the first preference votes (i.e.